My name is Reed L. McDonald and SSgt. Archie L. Jones is my hero. 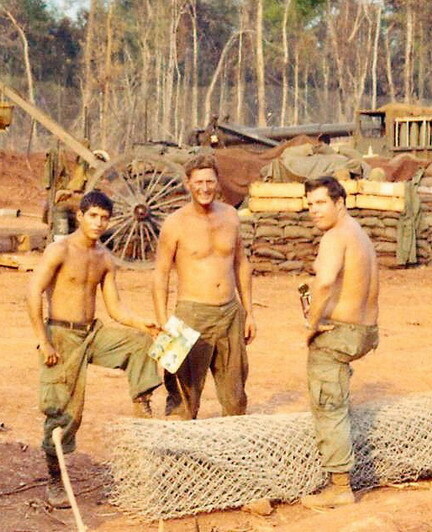 He is pictured above with the smile and holding a map at Fire Support Base Ft. Defiance near the Cambodian border. I served in the U.S. Army in Vietnam with SSgt. 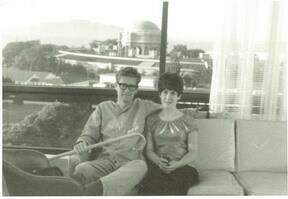 Jones in 1970, and without him I would not be alive today. He was the Gun Chief of an 8 inch howitzer with Alpha Battery 6/27th Artillery. a picture of what one looks like mired in the mud at Fire Support Base Burkett. Fire Support Base Burkett is the place where I’ll begin my account of SSgt. Jones, and what he did for me. 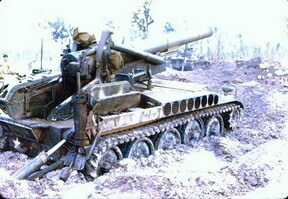 On May 6, 1970 we were repositioning our two howitzers from FSB (Fire Support Base) Burkett to FSB Wade. FSB Burkett was named after a 1st Sgt of the 11th Armored Calvary Regiment who lost his arm while we were under attack at FSB Ft. Defiance. We were also hit while at FSB Burkett and I mention it here to give you the flavor of what we were doing at the time. The Fire Direction Control track, the one I was supposed to ride on, was unable to move on May 6 and had to be towed. Since I had a little rank, (I was an SP5-E5), I chose not to ride on the FDC track way in the dusty rear of the convoy. I got a ride on one of the 8 inch howitzers near the lead in the convoy. My friend Roy was the gun sergeant for this 8 inch howitzer, and I hitched a ride with him. Just he, I, and the driver, SP4 Roy Ransom, were on that self-propelled howitzer. The next thing I thought was, “Oh God, what a horrible way to die.” Apparently, the right track of the vehicle drove off a bridge we were crossing and the howitzer flipped off and turned upside down falling 15 feet into the water, pinning me under it; or at least that’s what I read about the accident later. I didn’t know anything other than what I could see was black. I was under the water, I couldn’t breathe and I thought I was going to die. I have no idea how long I was pinned under the track, in the water, but long enough to figure out that this was the end of my life. That’s when SSgt. Jones grabbed my head pulled it up and held it above the water. I could see his face above mine. Next he handed me off to a couple of other soldiers. That’s when he started to look for Roy. I could see him as he stretched and held his head above the water searching with his hands as far as he could reach under the water. I saw his face grimace and I knew instantly that he had found Roy, and I knew Roy was dead. I could see it on Sgt. Jones’ face. The man he found was SP4 Roy Ransom. I don’t know what happened to my friend, Roy, the gun sergeant. That’s all I saw. The next thing that happened was when they pulled me out from under the vehicle and out of the water. From my waist down it felt the way your elbow does when you hit your crazy bone. That’s the closest thing I came to pain then. I must have been in shock! SSgt Archie L. Jones saved my life. I know it as sure as I am writing this account today 35 years later. Without him jumping into the water and finding me, and holding my head above the water, I wouldn’t be alive to write this. I don’t know whether SSgt Jones received any recognition for his heroic actions that day. I was medivaced out by helicopter and never returned to the Alpha Battery or Vietnam. I know it’s way too late, but I want his family to know what he did for me on May 6, 1970. He was a hero that day. That’s not the end of my story. A happier memory of the time - My first daughter was born on May 7, 1970, the day after the accident. She would have been born without a father if it had not been for SSgt. Jones. I’ve told both my daughters and my wife what happened that day and they all share my opinion of SSgt. Jones. I regret that I never got the opportunity to thank SSgt. Jones in person for what he did that day. The Vietnam War was an unpopular war and upon returning home many of us just wanted to forget about it. Perhaps that’s why it took me so long to search for SSgt Jones with the plan to offer my belated thanks for saving my life. I was an angry and cynical young man after the accident those many years ago. I am no longer young and I am no longer angry. I am proud to have served my Country and to have served with SSgt Archie L. Jones.